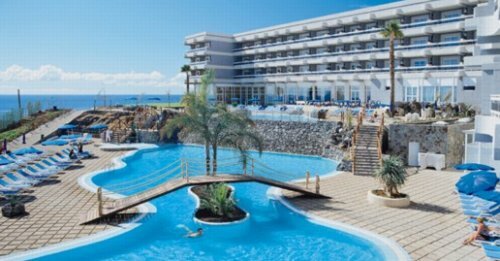 In an exceptional situation overlooking the Atlantic Ocean, between the golf courses, Golf del Sur and Amarilla Golf, the Hotel Aguamarina Golf is ideal for the enjoyment of a quiet holiday whilst practising your favourite sport. The Hotel has 199 rooms including suites and doubles, elegantly decorated which give a warm environment, all rooms are complete with bathroom, air conditioning, direct telephone, satellite T.V., Mini-bar and safe (optional). Our clients can benefit from special prices in all golf courses as well as water sports, excursions, etc. It also offers a fitness studio, sauna ( with extra) hairdresser, heated indoor pool, heated sea water pool, Beach Club, tennis court, paddle court and Conference Rooms with different capacities. - Billing Service 24 hrs. - Reception service 24 hrs.